Sometimes, the stars align for a boat test. Winter weather gaps are short and fickle, but after numerous postponements a quick blat up north to Whangarei to meet the new addition to the Hay Hay Marine family was on. 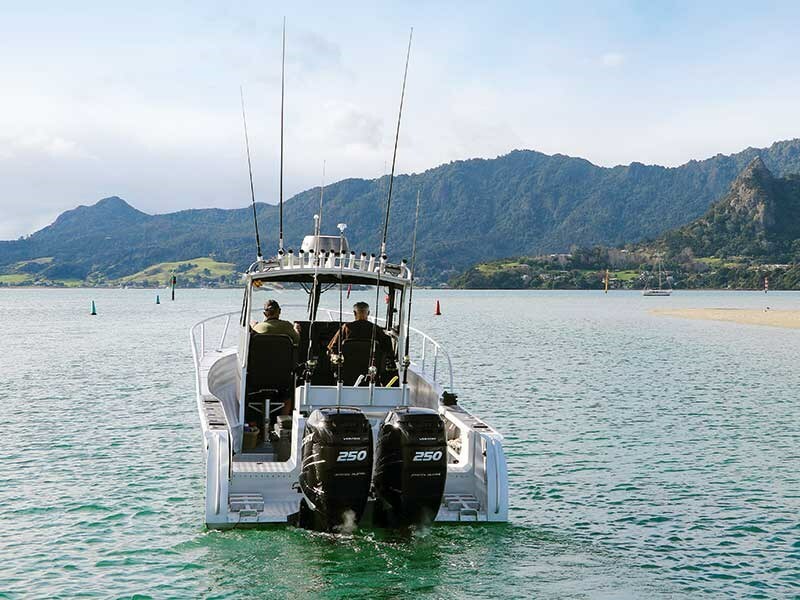 The Whangarei harbour boating area of the Hen and Chicken Islands is liable to all large Pacific influences and winter requires a well-found boat with a bit of sea-tested hardiness. 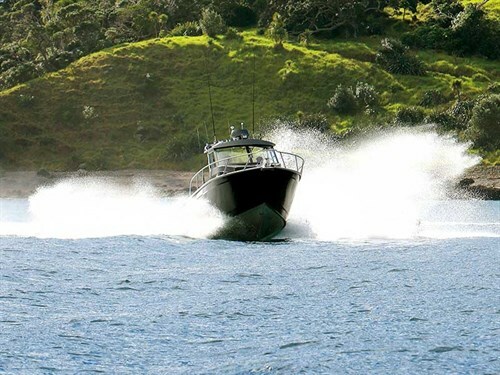 When the eight-metre Broadhill Gladiator arrived all black and polished silver, gleaming like the sun, every head in the nearby café and every grizzled, gumboot-wearing fisherman spun around to watch. Dressed in her lustrous Mercedes McLaren Black paint job, and coupled to twinned Mercury Verado 250’s sternward, she looked like the goth princess of your naughtiest dreams. The first boat designed by Warren Hay for his new boatbuilding company Broadbill Boats. For the fabrication base for the hull, a well-known southern boating company was chosen for the quality and strength of its aluminium builds. 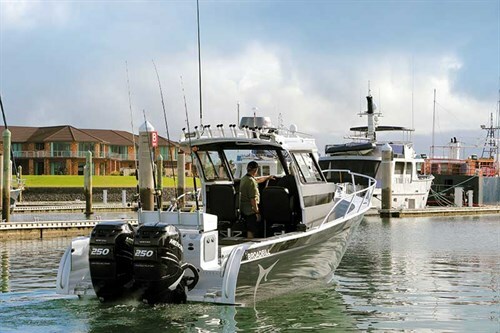 Hay heard about the new motors and systems that Mercury were making and designed the entire boat to fit this new ‘Joystick Piloting’ technology – the first boat manufacturer in Australasia to do so. The boat was designed from the propulsion system up. Every angle had to feed towards the centre of the cockpit and intersect at the angle of moment (the pivot point around which the boat spins). Joystick Piloting offers incredible gains in docking ease and holding position at sea through a GPS positioning system called Skyhook. Slipping between the joystick and throttle control is seamless and simplicity itself to use. When engaged the system splits the engines apart so that they act gently against each other setting up propulsion vectors that move the boat round the pivot. Slipping into forward and reverse noiselessly with no jerkiness, it maintains its position. We gave it a major job it in the rising tide run of 5kt-plus at the harbour entrance, against the wind. It held position perfectly. In docking mode, a twist of the joystick rotates the boat in either direction. There are two modes: a gentler, slower state for safety around other boats and marina issues and a more vigorous setting for open water holding. Nothing has been added that doesn’t assist with game and sport fishing. The GPS and Raymarine Quantum Chirp radar are relayed into two 12-inch Raymarine touch screens, giving access to every detail of engine management, propulsion and fuel use, as well as offering side-scanning sounder, fishfinder, chart plotter and radar in high-definition full-colour. The helming experience of this boat is one of the most electrifying I have ever had. The digital throttle is smooth and the twin 250 Verados deliver ferocious acceleration when flattened. I can only liken it to Jet Ski in a launch. Coupled to the boat are automatic trim tabs by ZipWake. These operate with a blade system and are continuously adjusting many times a second, ensuring the ride is always stable without the skipper having to fiddle constantly. At a shade over eight metres, she sits on a dual mag-wheeled Toko trailer with a stainless Trojan braking system and a grunty electric Trail Maxx winch and sealed stainless battery box. Holding the ship are 32 rollers which evenly spreads her 2500kg weight. Given the clever docking system with the joystick, and the power off the transom, the winch remained unused at the end of the day, except to snick up the safety chain slack. The Broadbill 8-metre is a walkaround and the space for casting and retrieval, anchoring and seating up front is very useful. At the bow there are two anchors, a large sarca on the starboard side coupled to solid chain and powered by a large Maxwell drive unit, and a grapnel and rope winch on the port, both with their own lidded stow compartments. These are operated from within the cabin with excellent sight lines. 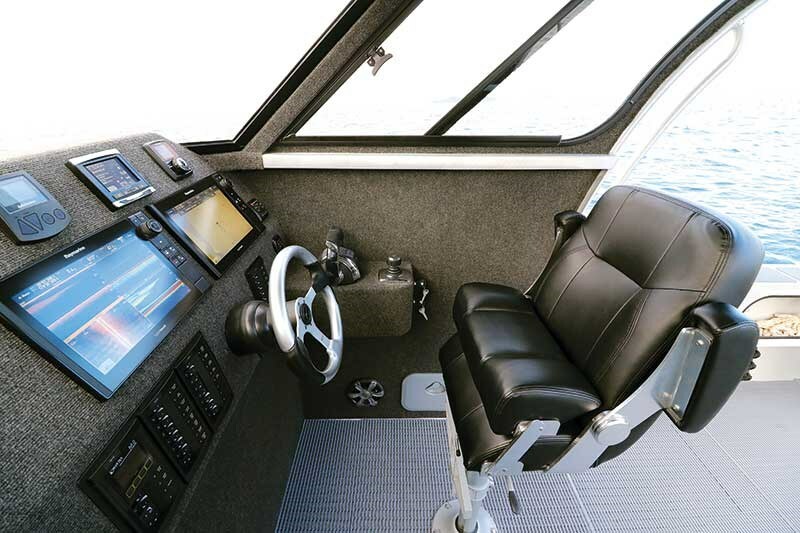 A padded seat cut into the edge of the forward cabin is a fine view station and seating for anglers and kids. I would like to see a small handhold either side for travel though. A good solid bow sprit and rails are standard; polished and nyaliced, they glow in contrast to the black, making a very smart look. Sea Thru has supplied the curved toughened glass windscreen, granting superb visibility. Parallax wipers either side with spray nozzles to keep the view clear of salt buildup. 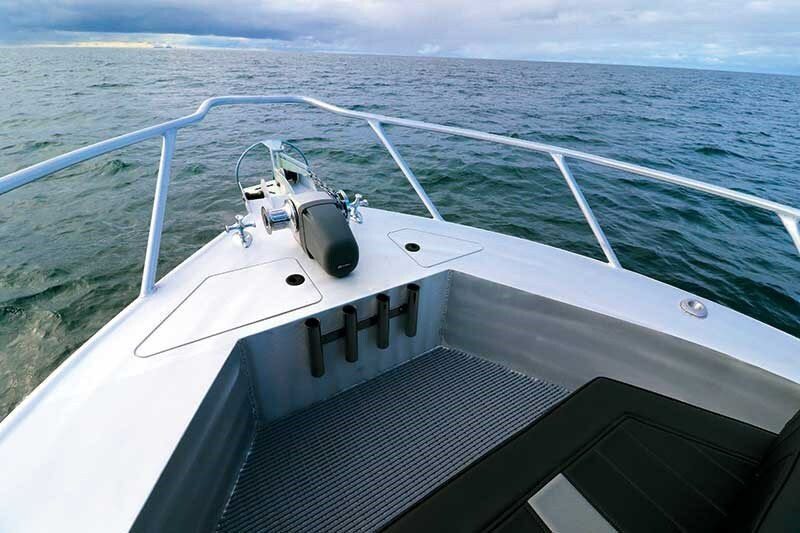 On the hard top of the cabin are the electronic sky connectors, Raymarine Radar and GPS and 13 rod holders. Relax Game poles come as standard and are fitted to mounting points in the roof. On the underside are red lights and white lamps. It is fully lined and holds two strong handrails. Forward, mounted into the padded cabin roof are two VHF radios and a stonking Fusion sound system - coupled to four glowing blue speakers and a subbie, tub-thumping appropriately. Two staunch hydraulic pedestal seats by HiTech are topped with padded rollaway-front seating and liftable arms. At $2.5k a pop they are not cheap, but very strong. The forward cabin is fully lined, has infills and an electric Jabsco toilet tucked away to starboard. Behind the massive electronics array on the console is a swing open door that lights up and every fuse and switch is a pop up relay, easy to see and identify. The helm position is comfortable to stand at, sit, or lean. Side windows slide, and the throttle and engine management controls, although a little daunting at first, soon prove self-explanatory. I don’t think I have ever been in a quieter boat running outboards. Cabin handrails are placed well and Hay is planning on more for the left hand at the passenger helm seat in future editions. Epirb is fitted in the top left of the cabin and is very accessible. Two fire extinguishers are out of harm’s way and easy to hand. Rod storage – so often a bugbear – is handled excellently with provision for 35 rods on board. 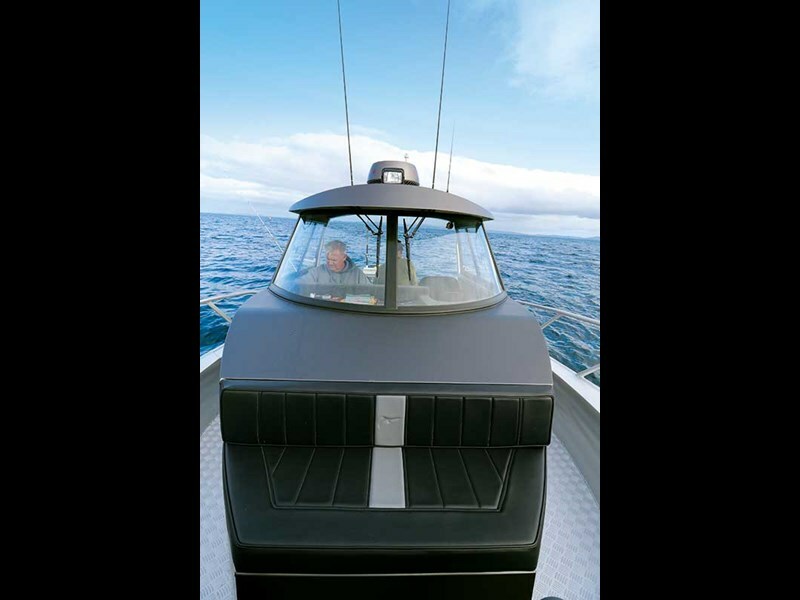 There are huge expanses to work in, cast from and for handling big game fish as well as two large transom doors held open with ‘rare earth’ type magnets. 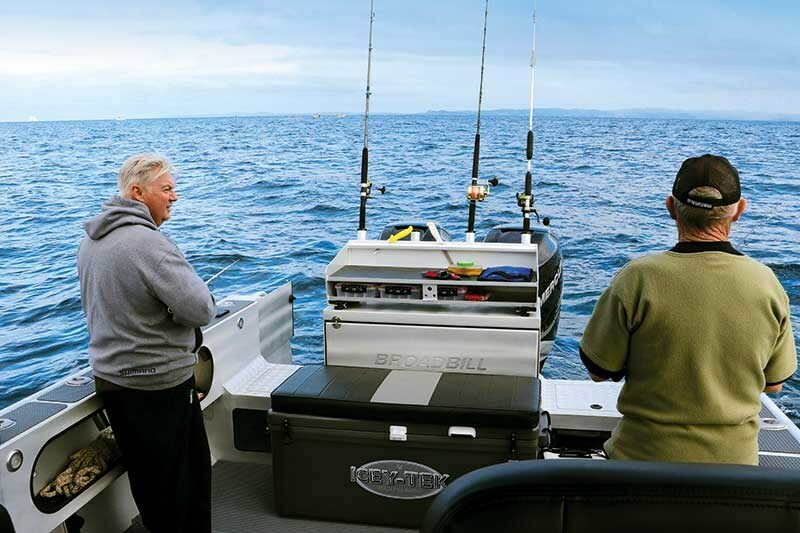 Four tuna tubes are built-in and the bait board and tackle box holders sit atop that sliding on nylon rails. Two huge live bait tanks with lights and drains to the duckboards are exemplary. With see-through front and lighting, livies are visible day and night. Hay has futureproofed as well as humanly possible to ensure all changes in game fishing methodology are catered for. 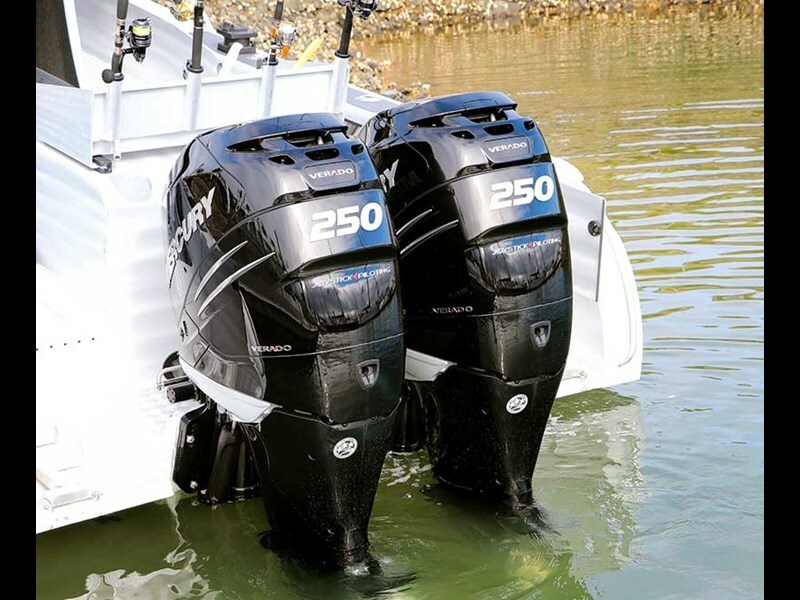 Safety-wise, there are two radios, two engines, two lots of double batteries, high off the floor with a waterproof access panel to switching and relays innovatively sited under a hatch to the side of the transom. The bait board and battery cover drops down to become a padded seat for a long trip home when the kids are tired. A deck wash system drains away through a clever deck drain with a simple grate, removing common bilge blockage issues. A swivel spotlight to the fore can be controlled from the helm and decklights and red courtesy lights mean night work is possible without being night blinded. Off the stern, large underwater lights attract fish at anchor. 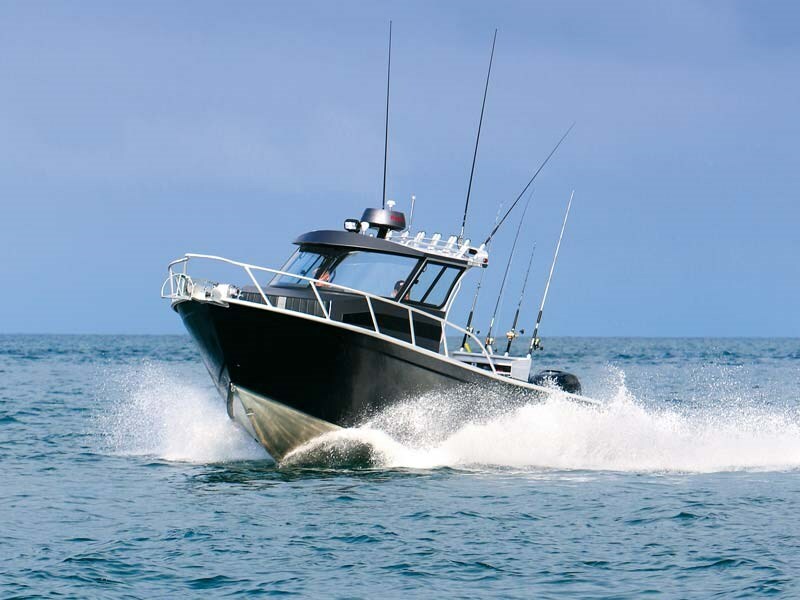 This boat is built to get out in any weather, target fish and get you home comfortably and safely with a minimum difficulty. That it succeeds in its first iteration is testament to the skill of its design team. The hull is massively strong with eight floor stringers, 6mm high-grade marine aluminium, and another 6mm on the keel doubler. Sides and transoms are 5mm, decks 4mm. A new type of squared deck matting offers foot cushioning and exceptional grip in the wet. Two solid boarding ladders sit atop the duckboard, designed to reduce splash and increase buoyancy when backing down on a gamefish. Built with a slope, it forces the water down and reduces slop noise at rest. With almost three metres of beam, the Broadbill is extraordinarily stable. With three people on one side, we induced no discernible movement. On the water I pushed it hard and was solidly impressed at its sea holding. Hay however, threw massive amounts of speed at it and whirled it around – I could barely hang on. The new power system, coupled with this hull, delivers a cohesive whole – Jet Ski-like handling and performance in a well appointed, highly capable aluminium launch, on a trailer. The title says it’s a game-changer. It isn’t. It’s a game-breaker.